At most of the shops, T-shirts were for sale with the line, “I survived the Road to Hana.” After driving the twisting, winding paths of this beautiful drive, I can understand the reason for celebration. The Road to Hana should not be missed because of the beauty along the drive, but it is not for the faint of heart and those that have issues with heights and hair pin curves. The trail is a 52 mile trip from Kahului Airport and without stopping would take 2-4 hours. 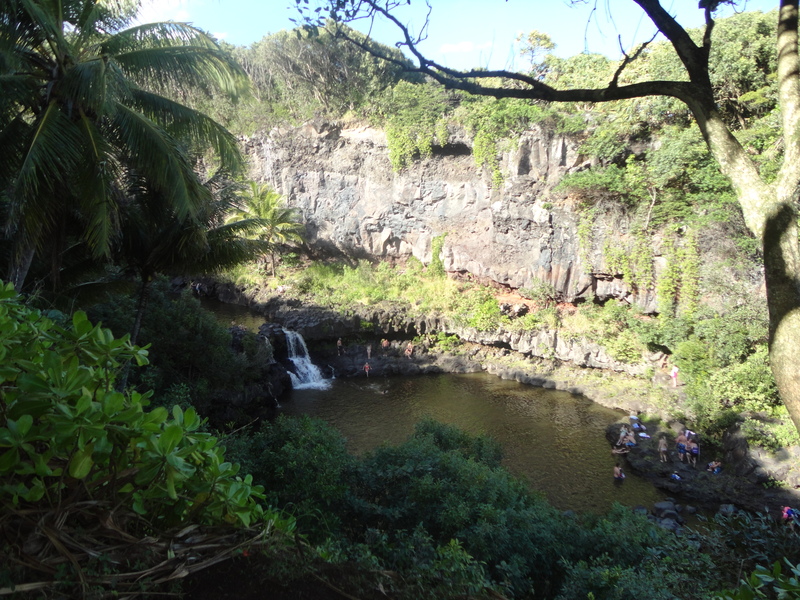 Along the Hana Highway are parks and lookouts as and Maui’s only coastal rainforest accessible by car. The road has little stops along the way like the Haleakala National Park, which stretches down from the dormant volcano’s summit down the mountain. Water flows down the mountain in many places along the road and it is easy to spy dramatic waterfalls, but here the water pools into over seven lovely pools that bring hikers and swimmers to become one with the water. I dipped my toes in, but didn’t try a swim although many others did. On our travels we spied spectacular ocean views, shacks that barely passed for domiciles, I think there are probably a few that have come to the Hana Highway and never left, living a commune type of lake in this tropical rain forest that rivals anywhere in the world with beauty beyond compare. Along with the beauty are quirky things like at one rest stop where we stopped for our lunch, several cats and roosters vied for a crumb or two. The roosters dominated the stop by far and the wild cats looked on hoping for a crumb or two the flamboyant roosters might miss. The sleepy town of Heavenly Hana was once a booming place with eight sugar plantations. Considered the most traditional town in Hawaii, we enjoyed a quick stop with ice cream from the local restaurant. However, we didn’t linger afraid to be caught on the dangerous roads once the sun went down. We had one final stop, famous aviator Charles Lindberg’s grave at the beautiful Palapala Ho’omau Church that was built in 1857. To arrive at the church we traveled that headed towards Upcountry Maui. We were ready to see new sites though and were not disappointed by clear ocean views, rocky terrain and a totally different beauty than the tropical side. My husband summed it up best when he said it was like the Beatles song, “Long and winding road”. If you could add in beautiful in that phrase you would have it! Log onto http://roadtohana.com for more information.